I'm starting to get items that don't quite fit into any of my categories and I'm finding that 'whatsnew' is getting a bit messy. So I've decided to have a try at this. Don't expect frequent write-ups but I'll try to put something in at least once a month with links to longer pieces. What I have been most dreading happened to-day. The bell rang and there at the door a smiling Oakley mother with the Village School Christmas hamper for the deserving elderly of the village. Well I will be 68 next week AND this government is personally attacking me and doing its best to make sure I know my place among the retired and irrelevent so I accepted it, gracefully I hope. At the moment I'm a bit occupied with thoughts of Christmas! This is because I have the bathroom in pieces as I fit a shower, new bath, basin and floor. As usual none of these little jobs are quite as straight forward as they should be as I struggle with eccentric plumbing and try to get modern components to fit into an old house. In other words, Christmas has hardly impacted on my tiny mind except the need to get the bathroom ready for our guests slightly before they arrive and knowing I have food to plan for and prepare for visitors starting on Christmas eve and carrying on for the week before New Year. 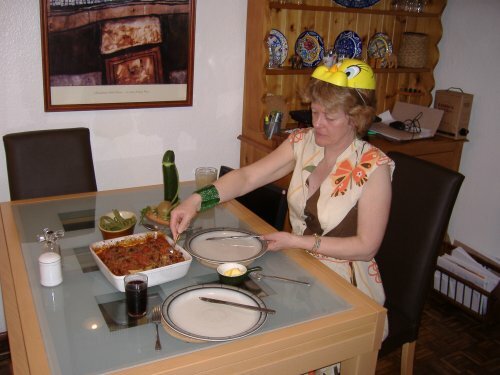 At least I have decided on the main components of the festive feasts. Christmas eve [6/7 people] we will have baked whole salmon with a lemon stuffing. 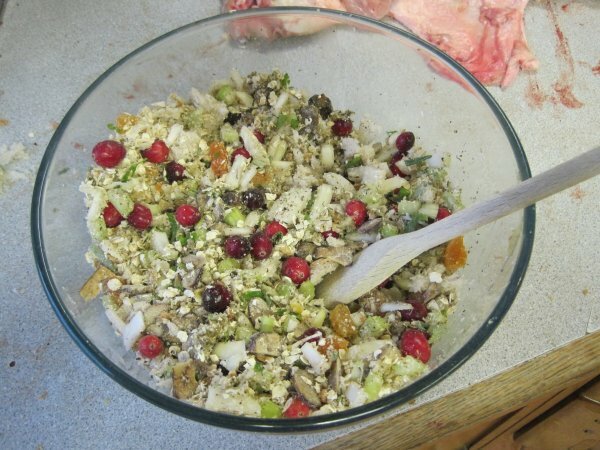 Christmas day [10/12 people] will be turkey, the first time in decades that I have cooked turkey for Christmas. My plan will be to do this like an American thanksgiving dinneraccompanied with baked beans and red cabbage. This gets me back to the school hamper which amongst other things contained a can of sweet corn and this got me thinking about the vegetables to go with the bird. Yesterday I bought a £1 bowl of okra in Thame market and decided I would cook these for our evening meal tonight. 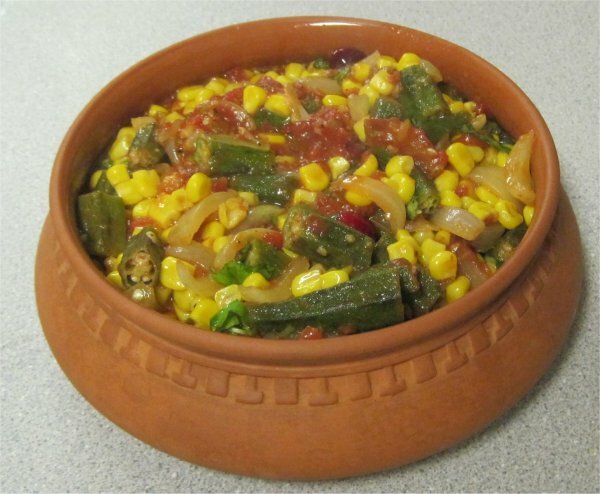 The result looked really festive, with the red of the tomatoes, the green of the okra and the basil and the gold of the sweetcorn, so I've decided that one of our vegetables will be okra and sweet corn, follow the link for the recipe. Last time I went to The Cheshire Cheese , 19 October, I headed down to St. Paul's to have a look at the Occupy the London Stock Exchange protest. 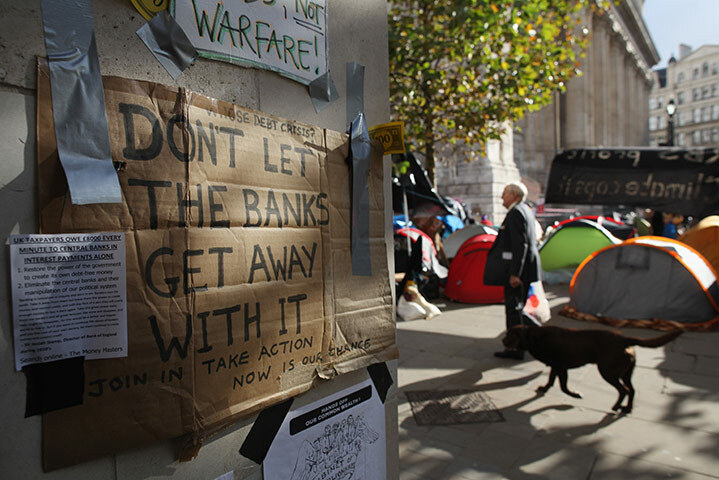 Apparently, I was not the only one to appreciate the signs as in this morning's on-line Guardian was a photogallery of Occupy London signs. and there in the first one was a certain aging gent with the protester's leaflet sticking out of his pocket. The dog nothing to do with him, though he did make sure he didn't stand around motionless for too long. 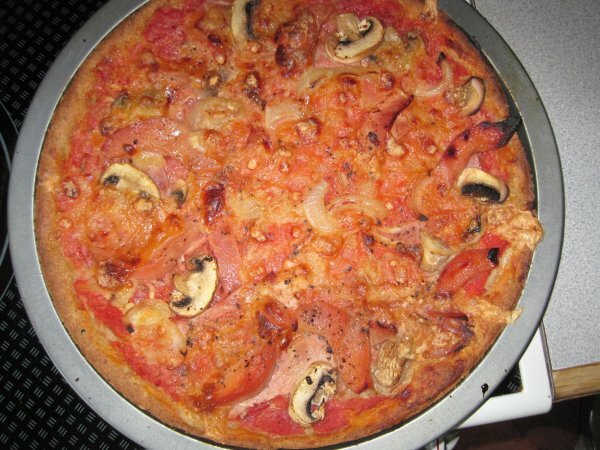 I had planned on having pizza for our evening meal with a gammon and pineapple topping but here was an opportunity to sample our new wares by substituting quince for the pineapple. This turned out to be excellent and much better than the usual pineapple so I am now scrounging round to find a further supply of quince to preserve some more. Our final recipe can be found in the recipe section but there seems to be quite a bit of conflicting advice on the internet as to how long to boil or bake the quince, a range of times from 30 minutes to two hours being quoted. Obviously, quince is a variable feast. We cooked ours until they were ready, ie al dente and that took about 35 minutes. A quick trip to Hastings to go to Alex's private view at the Hastings Arts Forum . 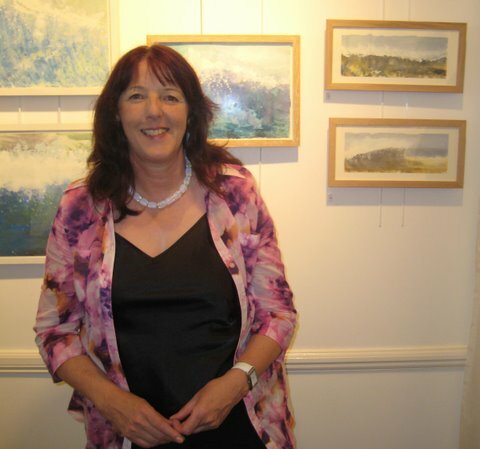 There was a good turn out for the private view and her work was very well received. She was even interviewed for BBC local TV . 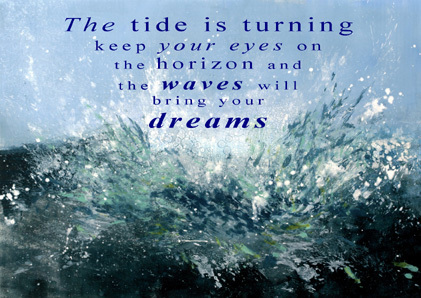 Alexandra's latest work is inspired by the sea and life in Hastings, from the frothy sea's edge to the distant horizon. The nearest wave as it crashes or simply washes on the shore is an endless fascination, and her paintings attempt to evoke the meeting of colour and form that exists for a unique moment. 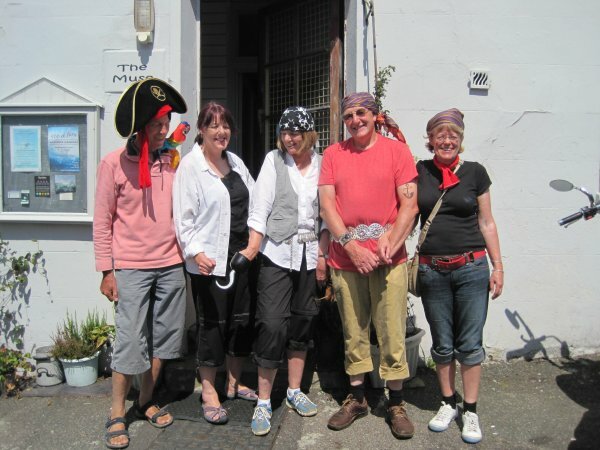 The private view took place co-incidentally with the Hastings Old Town Carniva l which had a piratical theme, Never ones to miss an opportunity to get dressed up, we soon donned our piratical gear and stepped forth to swash our buckles. 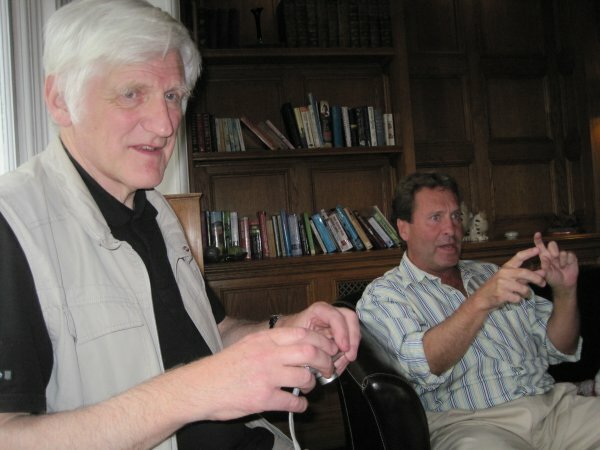 For the past six years, Jim has organised a series of visits, entitled 'Ruskin's Old Road, which have taken him to places visited and written about by Ruskin. We were with him in earlier years in Oxford and again this time, on what he claims will be his last Old Road. This time, we met up with the Ruskin aficionados in Oxford,in Coniston and at the Ruskin Library at Lancaster University . Our purpose in Coniston was to visit Ruskin's home at Brantwood and to hear a talk given by Jim about his travels on the old road and how it had broadened his understanding of Ruskin and his writing. A bonus was that this was also a 21st birthday celebration of the 'Friends of Brantwood' so we enjoyed cake and champagne during the interval. As a young man, prior to his going up to Oxford, Ruskin had sketched the view of Coniston Old Man from the East shore of Lake Coniston, very close to Brantwood. Maybe this was what brought him back when the time came to find a dwelling place for his final years. 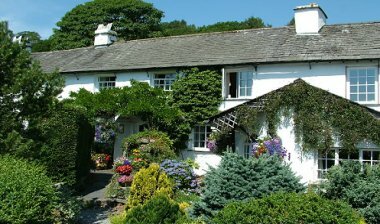 For Arthur Ransome fans, the area round Brantwood has much of interest, the Altounyan family home is its near neighbour as is Ransome's own house futher down the lake towards Peel Island aka 'Wild Cat Island'. Ruskin's biographer W. G. Collingwood was also Ransome's Old Skald, author of 'Thorstein of the Mere', a favourite novel of Ransome's childhood. 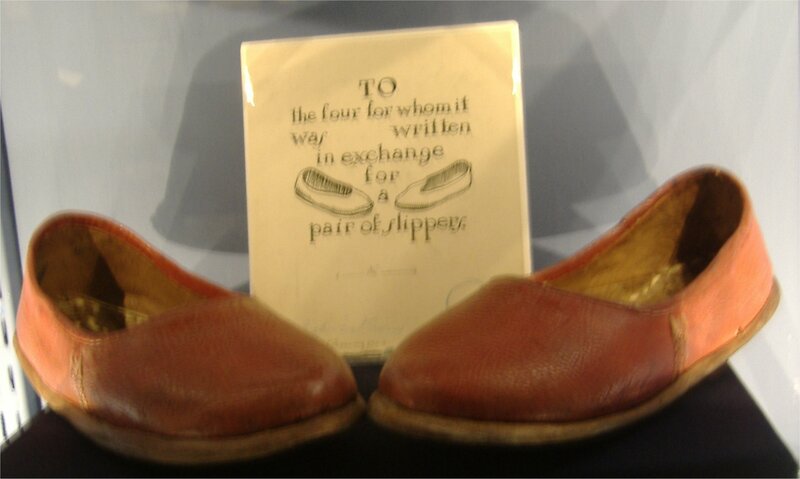 While we were there, Brantwood had a special exhibition about Ransome so we were delighted to see the pair of slippers that were given to Ransome for his fourty-fifth birthday by the Altounyan children and which inspired him to write Swallows and Amazons for them. 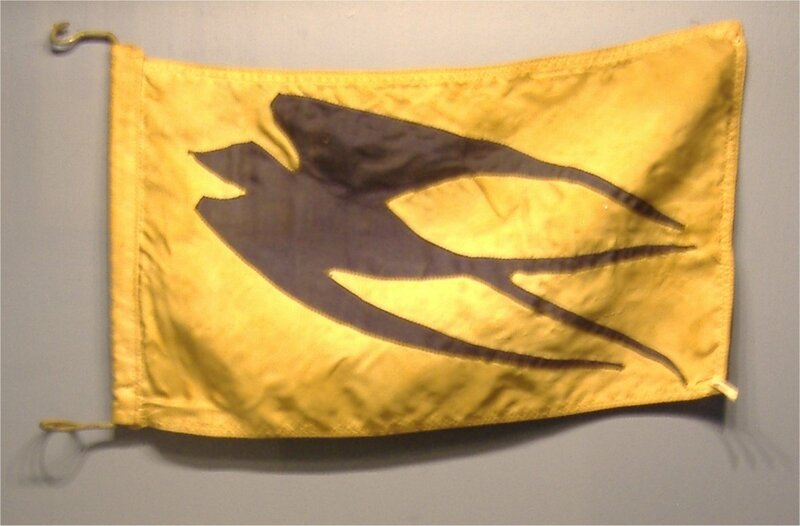 Also in the exhibition was the swallow flag made by Ransome to prove to Eugenia that if he was capable of making a flag, surely the children would have been able to do so as well. 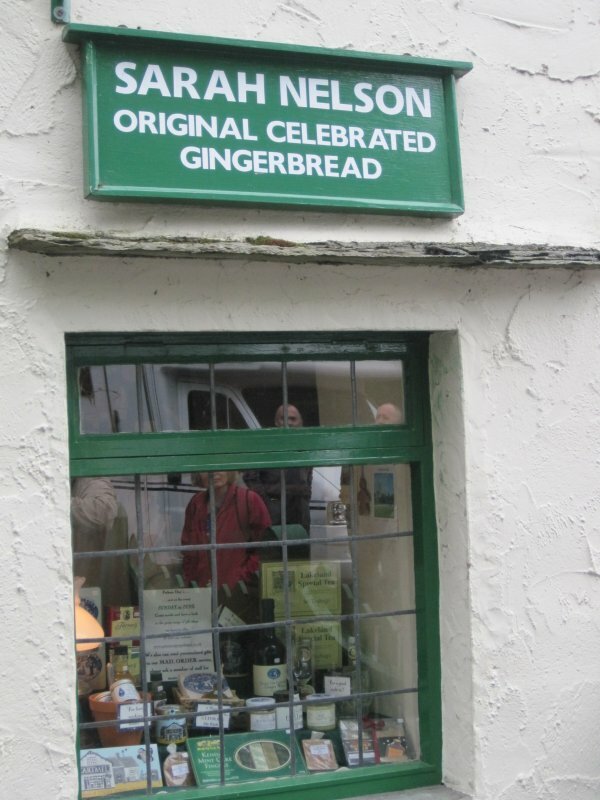 The museum in Conistone is also called the Ruskin Museum . 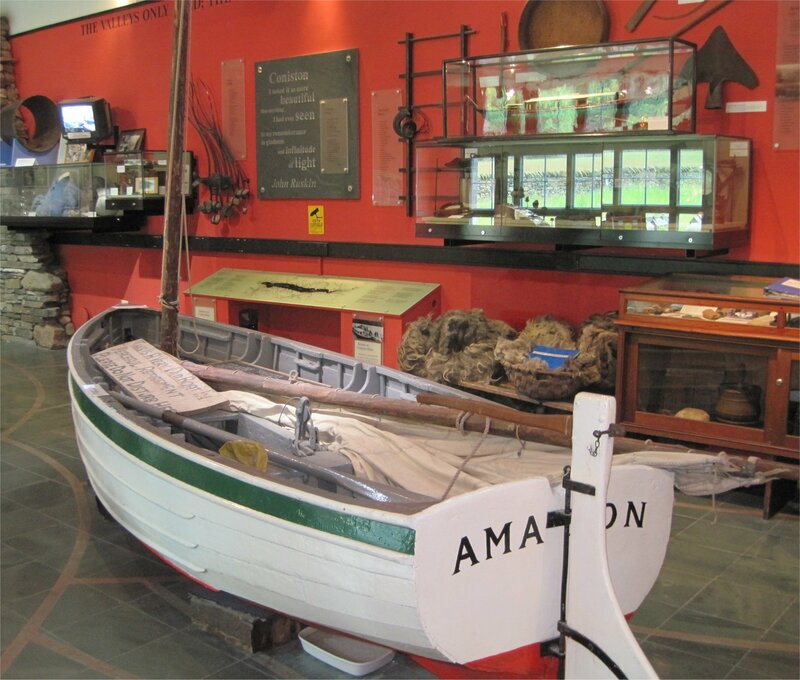 Their collection includes lots of examples of lakeland life including artifacts relating to Ruskin, Ransome and Donald Campbell. In particular, they have the Altounyan's sailing boat Mavis, now rightly re-named Amazon as she was the model for the Amazon of the books. 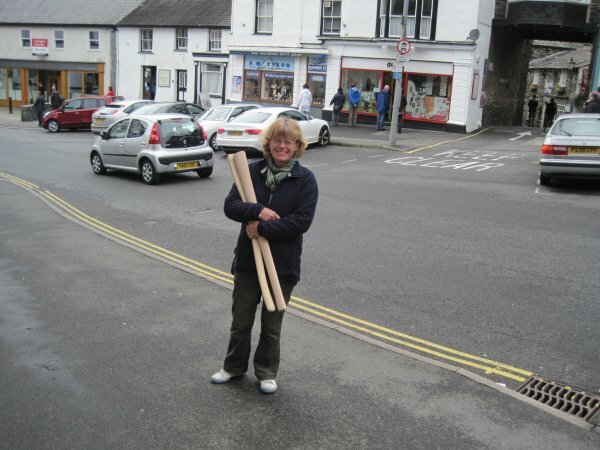 A drier walk round Ambleside including a browse round J F Martin's ironmongers shop. This looked like an interesting place so decided it was worth making an enquiry, 'did they have a mattock handle' well 'yes they did', the look on the proprietor's face leading me to believe that they were not often asked for mattock handles. This turned out so successfully that I decided I would have a try for another much sought after item [by me that is] so 'do you have an adze handle' - 'yes' to this as well. Happiness! But what of the other manifestations of the pre-occupations of lakeland villagers? 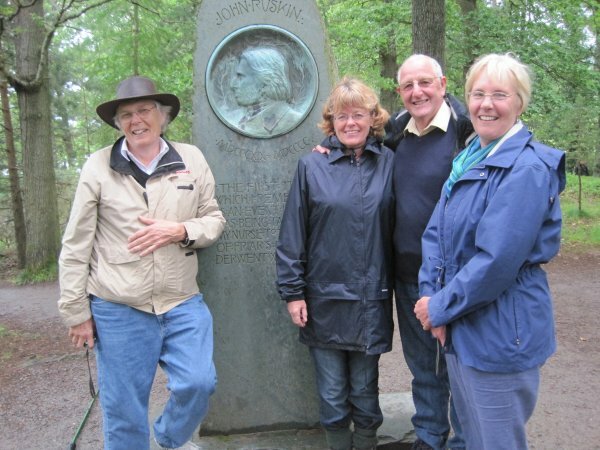 Then it was back on the Ruskin trail to see the Ruskin memorial at Derwent Water. Ruskin made his first visit to Keswick in 1824, when he was 5 years old. 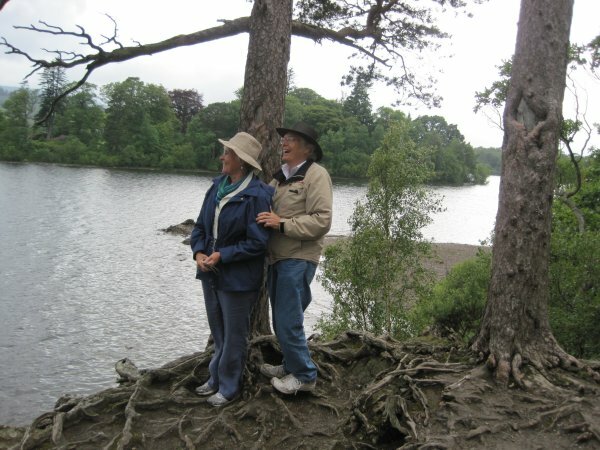 Later he was to recall that, 'the first thing I remember as an event in life was being taken by my nurse to the brow of Friar's Crag on Derwentwater' and he goes on to describe through a 5 year old's eyes, the twisted and knotted roots of the trees which became 'the creation of the world for me'. Then back towards Grasmere and the 'new bridge' across Easedale Beck. 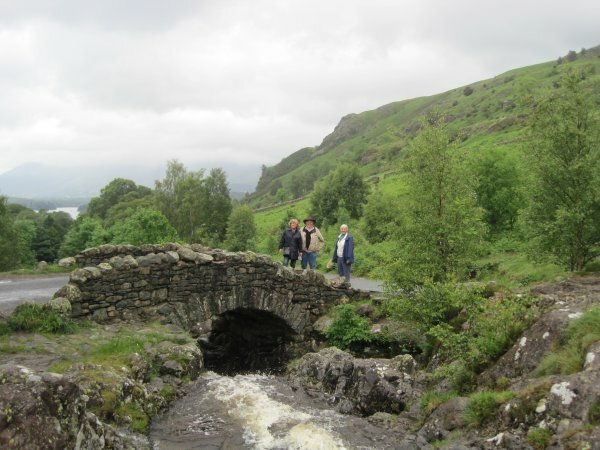 Ruskin described the view of the bridge and the water of Grasmere beyond as the most beautiful landscape in the whole world. 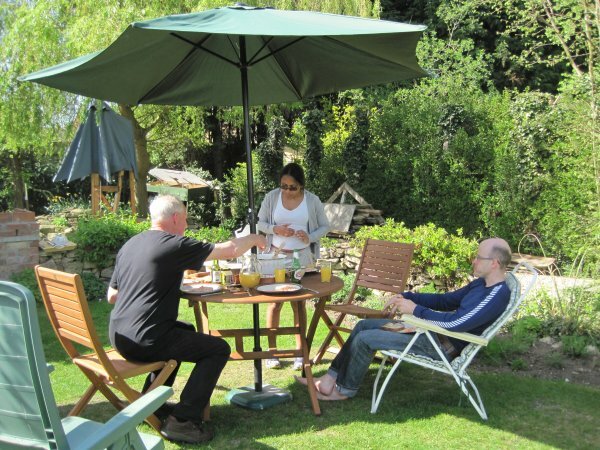 Diane and Kevin were staying at the Sun Inn in Coniston. 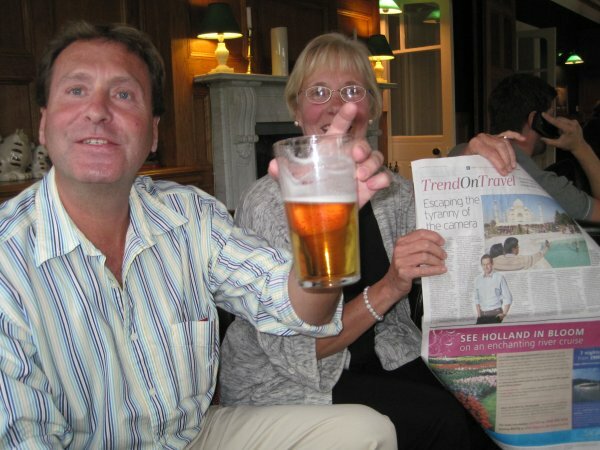 So we gravitated there and enjoyed evening meals and sampled the fine Lakeland ales. 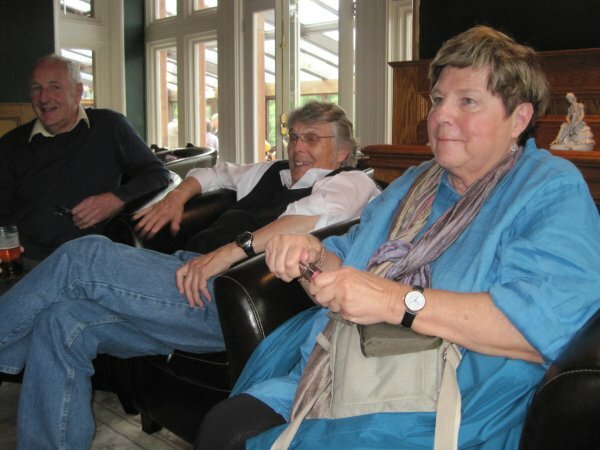 The celebratory dinner for Friends of Brantwood was also held there. Ruskin Library at Lancaster University . Just back from a week in Greece with Terry, staying at his house in Stoupa, near to Kalamata. We had several tasks to perform which made for an interesting study in contrasts. First the car had to be booked in for a service at the local garage and to have its towbar removed as this would not meet new legislation for the KTEO [MOT] test later in the week. This remains a complete mystery to me, as as far as I can see, every towbar in Greece is illegal as all extend beyond the rear bumper. There must be a nice little business in removing and replacing towbars in Greece. The garage was mostly outside and surrounded by the dying remains of various vehicles that were either waiting for parts or just waiting. Each with a neat pile of nuts and bolts and the offending part piled below it. Our next trip was to the solicitor to make an income tax return. He had an office straight out of the 70s and would easily qualify for one Rosemary's 'Obviosly a man living on his own' comments, more usually reserved for distressed looking boats on the cut. The K.T.E.O. test was duly taken, AND passed, in a very modern, fully electronic testing station, which was a model for efficiency, courtesy and viewing comfort. Our final task was to pick up the outboard motor, this mechanic was clearly OCD and had an immaculate workshop, organised and tidy, clearly he had a woman in his life. A regular trip was to Katerina's newly opened supermarket on the main road. It is a large store and has quite a big area on a mezzanine floor, this is completely dedicated to cleaning materials. I have never seen so much in one place and had to take a few pics to show Rosemary on my return. Unsurprisingly, she was in ecstacy when she saw them. There must be almost enough to sort out all single Greek men, boats and offices. Perhaps it was significant that we did see an empty tin of Spam floating in the cut as we approached the 'unlovely end of the navigation' as it says in the canal guide. However, there is at least one redeeming feature of the place for the cognoscenti, and this is to be found on Platform 5 of Slough railway station in the form of a stuffed dog, Station Jim. Alas neither of us had cameras to record the apogee of our trip to Slough so those with the inclination, will have to follow the links to see what awaits the determined boater. This is what wikipedia has to say about Slough, and Station Jim. In 2004, I was commuting to work from Iver on the Slough Arm while Cribbit was having her bottom blacked. Sometimes it was quicker to get the fast train to Slough and then backtrack to Iver on the slow train. The slow train leaves from platform 5 which is how I came to know about Station Jim and his story. In fact I got to know it rather too well as sometimes there was a long wait for the slow train. Around this time an article appeared in 'The Journal of Improbable Research' about an American Post Office dog that became quite a celebrity. The story of Owney prompted me to send in a contribution to the journal about Station Jim. 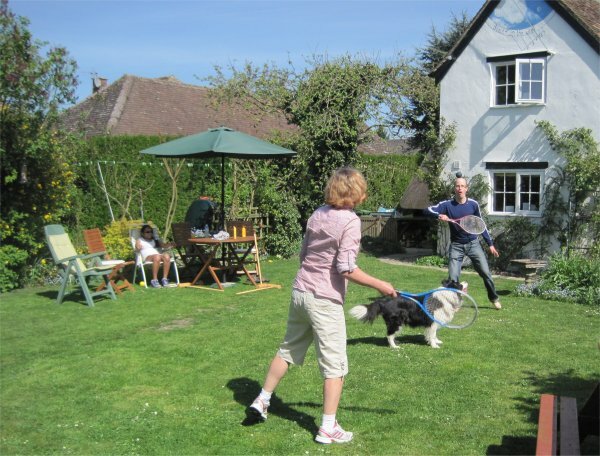 Along with the rest of Oakley, we had our first BBQ of the season on Sunday. 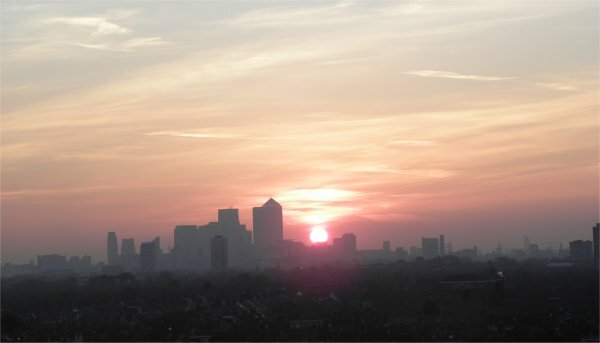 I pedalled to the allotment through a thick haze of BBQ smoke. 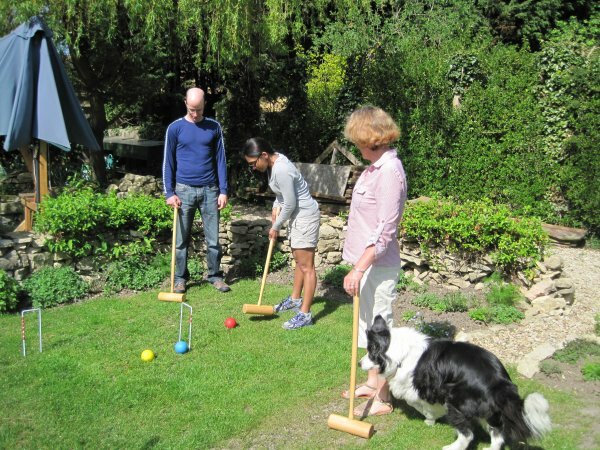 It was great to be outdoors in the sun and we had the added pleasure of Andrew and Sonia's company which meant we had a full complement of players for croquet. After lunch the energetic got out the tennis 'bats'. 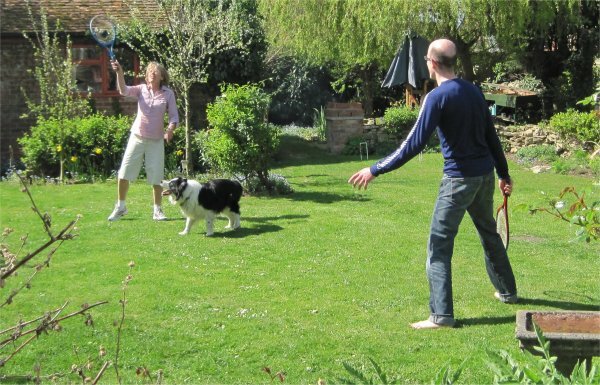 This game is only possible with the help of Josie who makes an excellent balldog. There were many cries of Kola would have got that one! There has been some rustic entertainment in Oakley of late due to a manifestations of RATS. They say that in London you are never more than 1 metre away from a rat, so you would expect that people in a rural community would be somewhat used to the idea that there might just be a few about here too. As it turns out this isn't quite right, with accusations and counter accusations about the cause and encouragement of the local rat population. Some assert that it's the hen keepers that are encouraging the beasts, some the cattle farm, others the organic gardeners and their compost heaps. There is a school of thought that puts the whole rat residency of Oakley under the playing field equipment shed. Suffice it to say that there are plenty of rats about for whatever cause. We have to own up to a liking for feeding wild birds so when a large brown furry one appeared on our bird feeder the other day it was remarked with interest. [Most are small brown birds as every ornithologist knows]. People often ask me 'But WHAT is it FOR??' and I give the usual things about finding out more about stuff and going back to the BIG BANG etc and watch their eyes glaze over in the telling. Paul made the comment that the LHC is 'just' the highest powered microscope in the world and that it looks at what is inside protons. I thought that this was a great description and I shall be using it myself in future. As it happens, the very next day, the Guardian had a link to a video with almost the same content as the lecture, though I have to say that I think Paul's lecture was rather better. However, the video does contain archive footage of Rutherford, Thompson and Gell-Mann so is well worth watching for that alone. Having thought that I had captured the ultimate Gansfield last week, the mist has supassed itself this week with more porridge. Have given up the plan of a photo a day! Its been so dull they would all look like porridge, a visual Gansfield. But I have taken a couple through the windows on the other side of the floor. 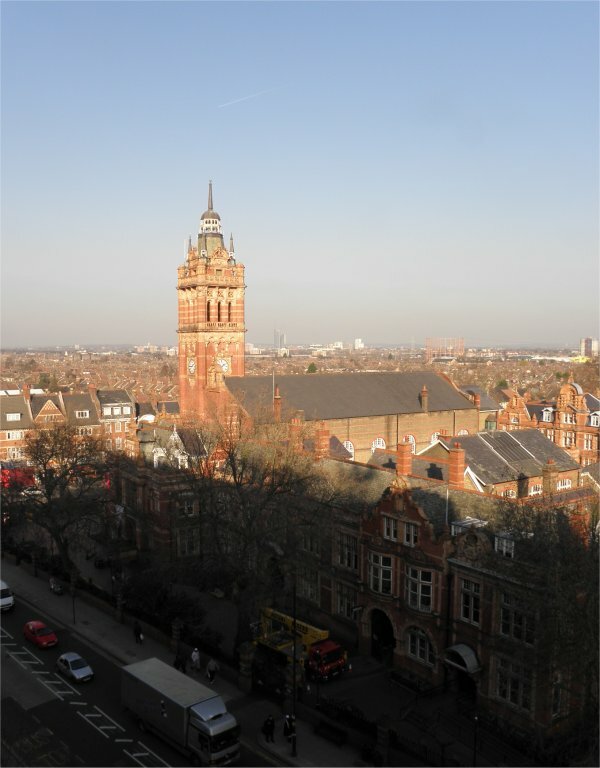 This faces East and is, of course, the view from my old office, albeit from a more lofty perspective. To my surprise, I find myself working again, but only for a short while and part-time. I'm also finding that I am quite enjoying it! My office this time is on the 6th floor, I always wanted to work up there as 7 flights of stairs gives me a good start to the day and the view is marvellous. 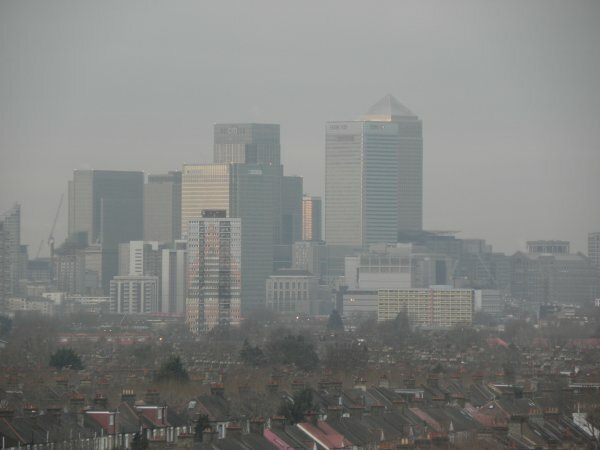 I'm trying to take one photo each day from my desk, so far the weather has been pretty bad, which is a good thing from the point of view of the allotment holder who can't bear to be inside when the weather is fit to be outside, but not so good for the photographer! My office faces roughly west and I take two pics, one as far to the south as I can see, this has the Dome just in it and the other includes The City with West Ham United football ground to its north edge. 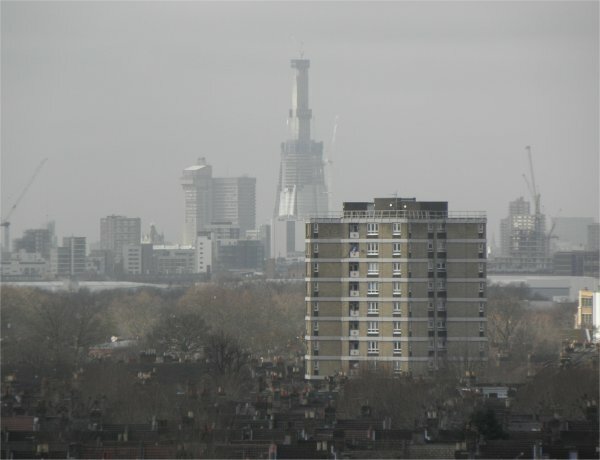 Of course, I'm not the only one photographing the changing skyline in the City, this morning's Guardian also has pics of the Shard in progress and an article about it. Oh no not more concatenated birds!!! Of course I forgot to take a photograph of the Christmas birds when they came out of the oven on Christmas day so I decided to have another go for our gathering on New Year's eve. Not so many people for this do, which was just as well as large birds were in short supply in Thame in the aftermath of Christmas. However, I did manage to locate a rather skinny duck, a guinea fowl and a chicken. Add a brace of pheasant breasts from the freezer and there was the making of New Year's eve dinner. Clearly, my sewing and taxidermy skills are in need of development, but as the composite creature came into being, its true nature started to be revealed. With the pair of duck wings added to the six other bird legs it could be nothing other than octospider. Fans of Arthur C Clarke will recognise the octospider from his Rendezvous with Rama novel, and what could make a finer New Year's repast if you can't get any Manna Melons? 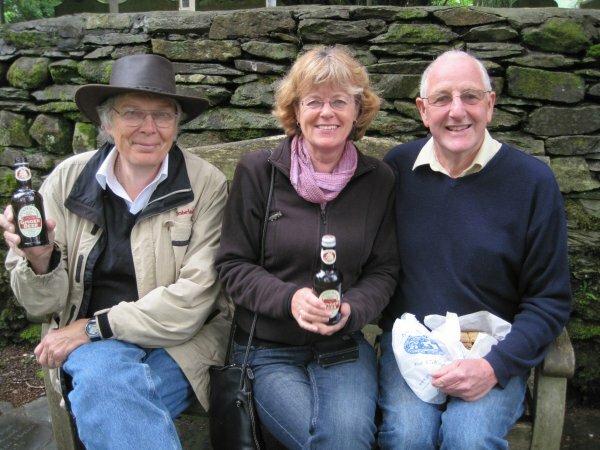 When I was little, we would often go over to Matlock to visit relatives, often taking my grandparents with us. 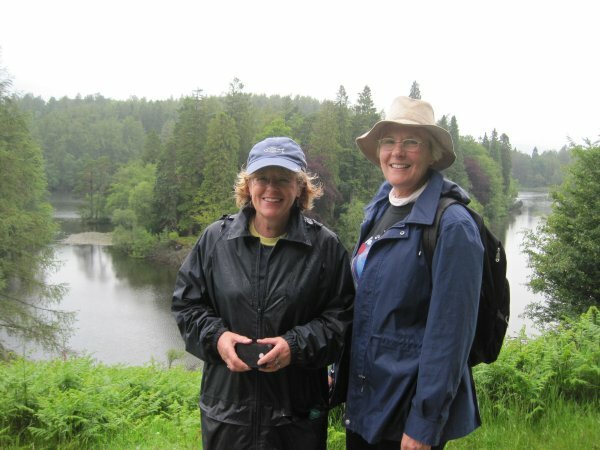 One of the attractions of these trips were the visits to the various attractions of the area, in Matlock, we would visit the famous petrifying wells and wonder at the conversion of everyday objects into stone. We would also visit what are now called 'show' caves, Poole's Cavern, and Speedwell Cavern, for example, though in those days they were somewhat more primitive than they are now. A memorable visit to the Blue John Mines with my grandmother passed into family history. On entering the cave, Nana decided it was a bit too demanding for her so negotiated with the guide to be abandoned by the group and await its return on the way back from its tour. 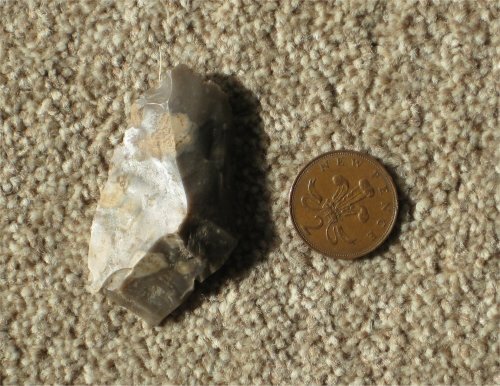 Apparently, she used her unsupervised time to good account as once safely ensconced back in the car, she revealed to us the valuable pieces of blue john ore she had been able to pick up off the floor of the cave. Tightly clutched in her hand were a short length of candle and a snail shell, sadly lacking its original inhabitant. Now one of these attractions, I forget which, boasted an eclectic little museum which contained, amongst other things, a decaying Egyptian mummy and wonder of wonders, a double headed calf. This latter used to fascinate me and over the years I would rush to its cabinet and scrutinise it thoroughly. As time went on, the popularity of the attraction declined and the exhibits became more and more decayed to the point that on our last visit, the taxidermist's stitching became obviously visible where the two heads had been joined to the body. To those of you who have been concerned, can I re-assure you that no octospiders were harmed in the production of this New Year's eve dinner. I've been trying to decide what to have for Christmas dinner this year. Looking for inspiration, I checked out the Guardian's Festive page and was very impressed with it. Of course I had to look at the multi-bird roast recipes as this is what had been hovering in my tiny mind for our Christmas festivities. I was especially taken with the de-boning video so I decided to give this a try. Jordi, Paulo and Eron were staying with us for the weekend so this seemed a good opportunity to test the technique. 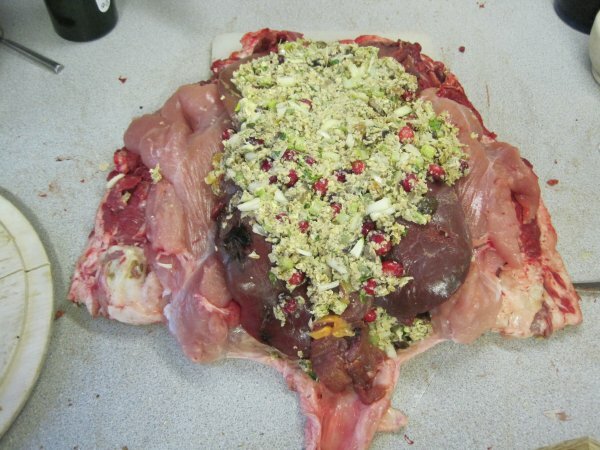 So I bought a large chicken, de-boned it and stuffed it with pheasant breasts and stuffing. The de-boning was much simpler and quicker than I had imagined and the carving was a joy! 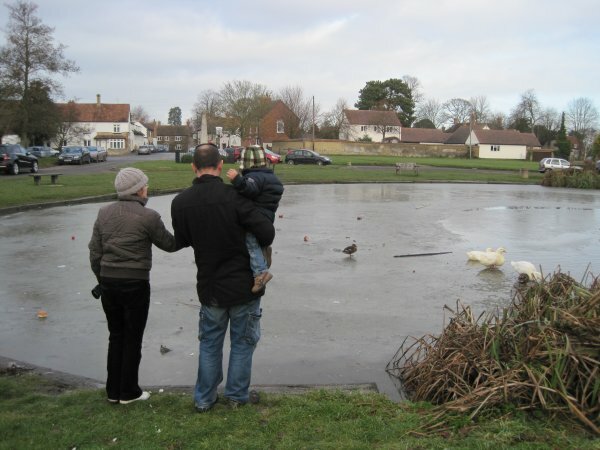 On Sunday we went up to Haddenham to feed the ducks. They had obviously been over exposed to small children and their bread and were less than satisfactory in providing our required entertainment. This settled it, their cogenors would provide our Christmas dinner. 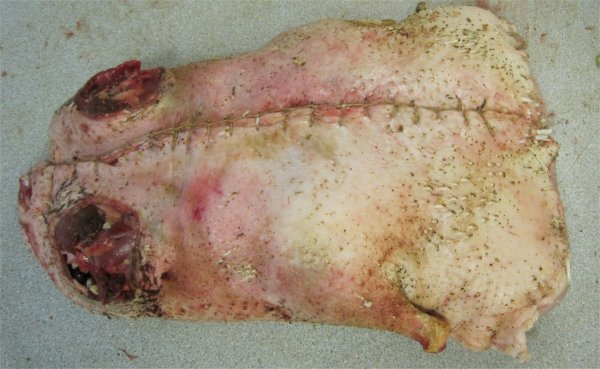 Rosemary has been rather keen that we have a turkey, now I never rate turkeys as I find their breast meat bland and dry and their dark meat is full of sinew. They do make very good stock for soup though. I much prefer them cold and as left overs. It was Thame market and farmer's market to-day so I thought I would see what I could find. 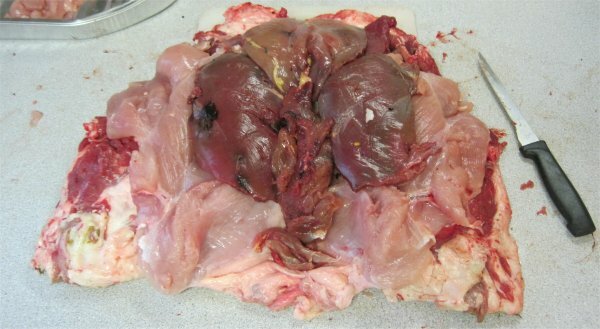 This turned out to be: a large, barley fed Aylesbury duck [£10], a wild goose [£10] and a packet of pheasant breasts. [4 pieces] [£3]. 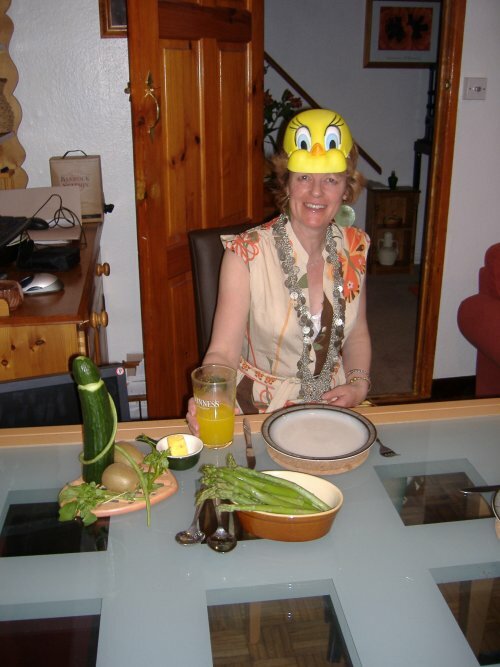 Then I went to Sainsbury's and got one of those so called turkey crowns. 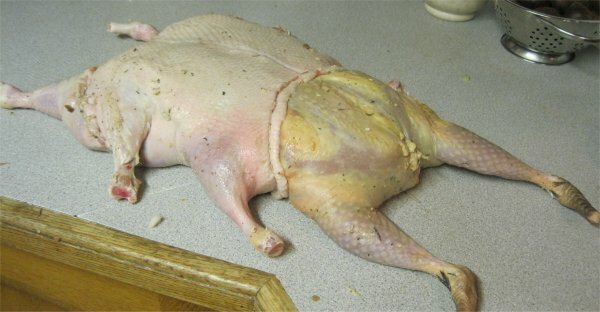 [£20] Decided that the latter was not really worth it and wished after that i had bought a whole turkey. Anyway the lot has all been boned out and re-assembled into an alien bird and is now putting its feet up in the freezer, waiting for its big day on the 25th. 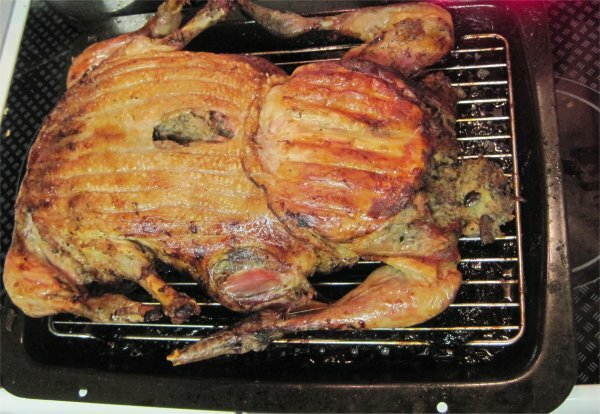 It will be roasted with the duck on top and the turkey underneath. 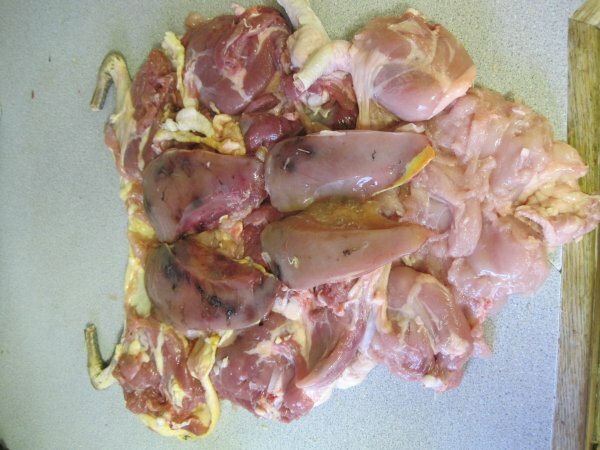 Earlier examples of Concatenated birds and Stuffing can be found in these links. I'm busy making Christmas presents at the moment so came home from Thame market well loaded up with lemons, grapefruit, oranges and limes. The plan was to make a 4 fruit marmalade but as I seem to be into curds at the moment thought I would give 4 fruit curd a try as well. The trouble with stirring these aromatic and steamy pans is that it gives plenty of time for refection. 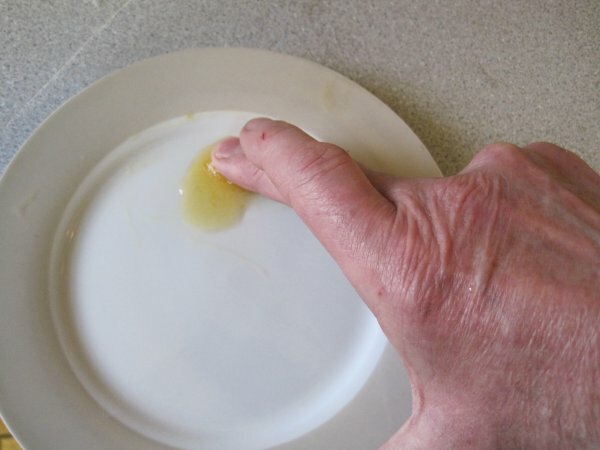 This time, I was musing that I didn't have a good pic on the website showing the 'wrinkle test' for the readiness of jams for bottling. Here was my opportunity. This didn't quite turn out the way I had expected though. I like my marmalade with lots of peel so couldn't bear the thought of throwing out the peel from the fruit I had used to make the curd. [Even if it was a bit depleted having been zested.] So it had to go into the marmalade mix as well. I'm told that the pectin content of citrus fruit is mostly in the peel so this batch of marmalade got a double dose. Add to this the extra time that the pot was a-boiling whilst I was holding the camera steady in one sticky hand and the other was doing the wrinkle test. Of course to capture this moment on film, the wrinkles needs to be sufficiently obvious so as to be easily visible so I let it go a bit further than I would normally have done. What I am trying to get round to is that by the it was ready for bottling, it was more a case of cutting it with a knife than spooning it into a jar. So I've had to boil it all up again with added water to get something more like a spreadable marmalade. I'm following two quite different round-the-world expeditions at the moment. 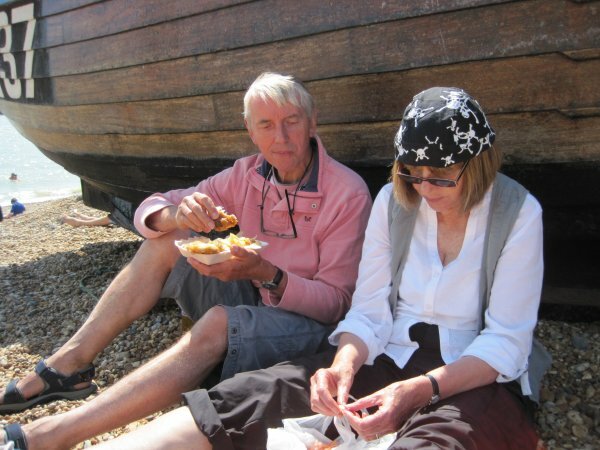 Rosemary's daughter Katy and partner Anthony are doing it by bike and have just arrived in Greece and friends Iain and Nikki are doing it by shoestring and have just arrived in central Siberia. The Mog Blog Nikki and Iain's wonderful travels around the world. 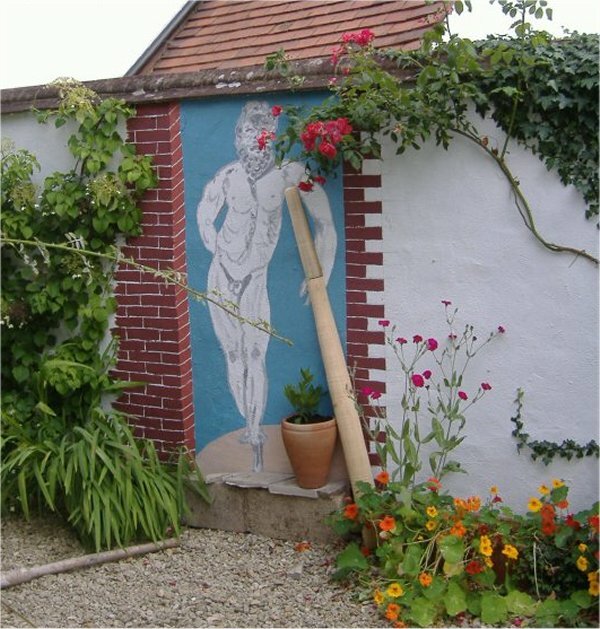 Ever since I visited Gilbert White's house in Selborne, I have wanted a folly similar to the statue of Hercules in his 'output'. A convenient visit by Rosemary to Sheffield provided the 'cover' needed to bring this aspiration to reality. I particularly like Hercules as a character and remembered the statue of him in that I had seen in National Museum of Naples (Museo Nazionale Napoli). My plan was for a trompe-l'oeil, using a mixture of painting and solid bits. 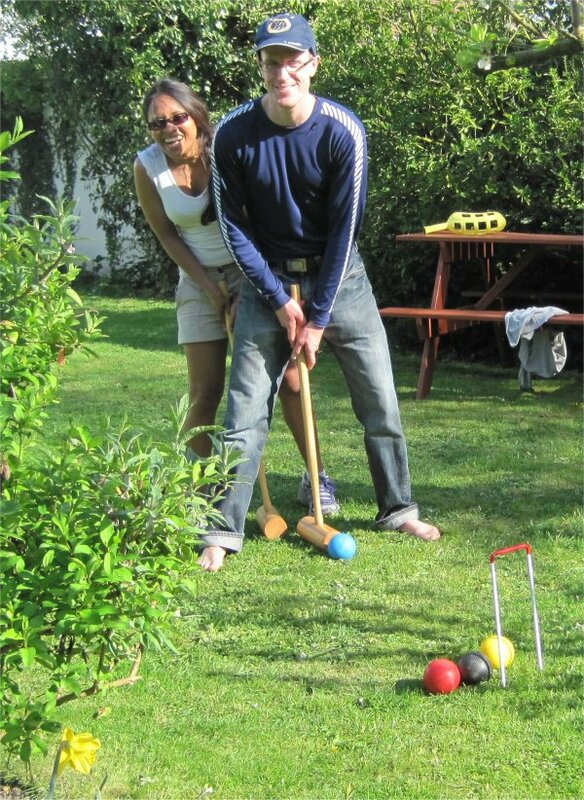 I made a plaster cast of my hand and foot, turned a wooden club and bought a greek looking plant pot which I cut the back off and planted with a bay tree. 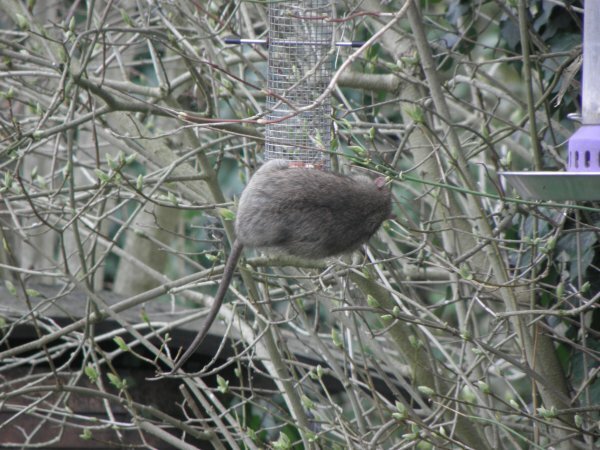 I can't say that the new addition to our garden was greeted with much enthusiasm by Rosemary on her return from Sheffield, but she was adamant that she 'was not going to eat her lunch looking out on his dangly bits'. 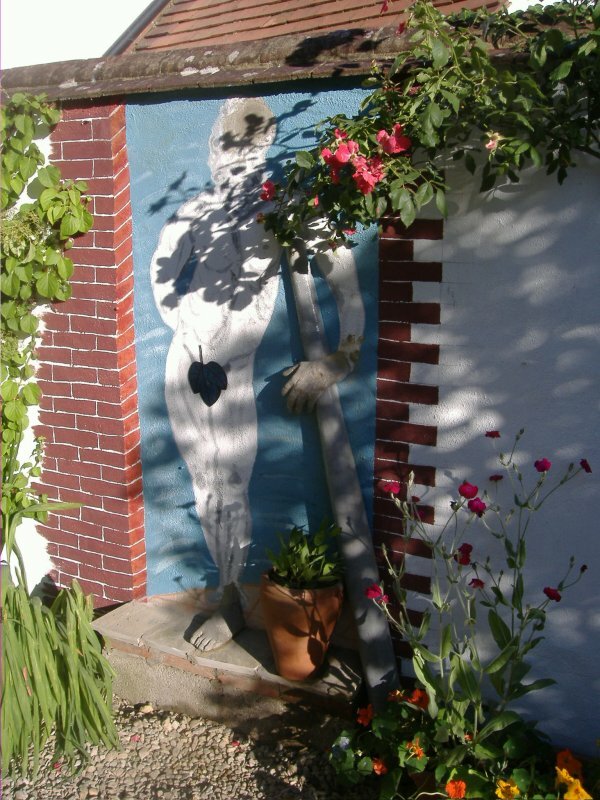 Fortunately, these were not bits that I had modelled from life, so were easy to cover with a suitably chosen fig leaf. 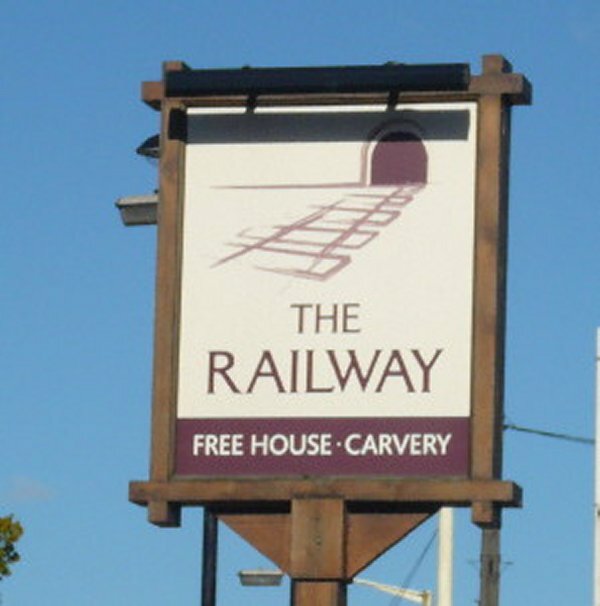 On the way down to Greenford Station from the cut, you pass 'The Railway' public house. The quality of its pub sign has only just impacted on me but it is a sight to behold! Just back from a few days on Cribbs, mostly spent by me almost managing to install engine remote controls and by Rosemary in major cleaning action with bleach and industrial strength chemicals. Apparently, parts of Cribbit are now suitable for habitation by her imperial majesty though I am missing the smell of diesel. My job involved bending bits of metal to fit round and through the diesel injector pipes to hold the engine shut-off cables. This provided a spectacle for random passers-by taking in the sunshine. 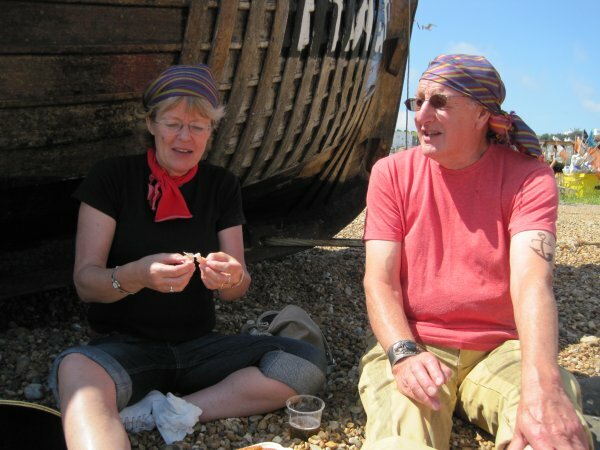 One such treated me to a long, and to me mostly incomprehensible, ramble about my activities in the bilges. It turned out that he was speaking Punjabi so we spent a little time in the 'naming of parts'. Our first item was the vice which I was informed was called something that sounded a bit like 'anvil', saw was 'awr' and engine 'mjin'. He also spoke to Rosemary but as she shows no sign of knowing the Punjabi for bleach, it looks as though he was less successful with her though her useage of bleach continues to be exemplary whatever it might be called. I've had several trips down to Cribbit lately, still working on the electrics [err batteries] and trying to get her painted. As work has been the essence of these trips I've not gone down to Greenford but just moved 300m away from Willowtree and moored on just about the only bit of Armco pilings on the grand Union Canal. Of course, what this has done is to bring me into contact with various members of the public, sane, sober and others sorts! 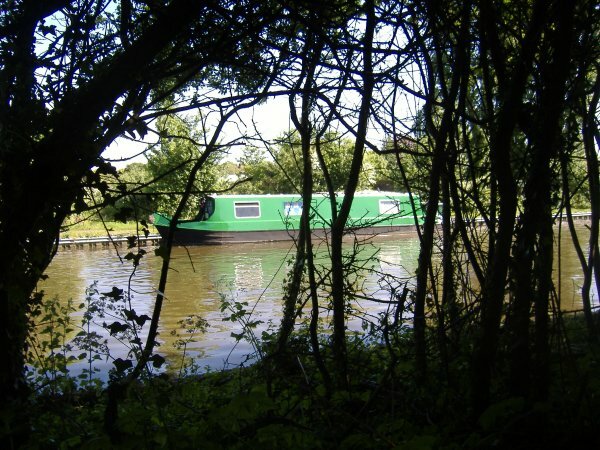 Last week, there was a great twittering noise and much to-ing and fro-ing on the towpath. It turned out to be a mixed group of young people, some in scouts uniform with several worthy minders in day-glo jackets. These latter handed out fishing rods and eventually the group settled down to a serious fishing competition. Of course, I was just quietly getting on with the painting and as result completely invisible to them. They were being coached in their fishing activities by a very keen young lady who I heard telling them that the bait they were to use was maggots and that the best way to get these to catch fish was to warm them up first by putting them in their mouths. Lots of arghhs and ugggs at this suggestion so not sure how many took up her advice. 'Do you need a licence? Now what was all that about? a jobsworth in the making I think. Can't say that I have finished the painting yet but both sides are now green, just the ends and decks to complete when I get a chance. 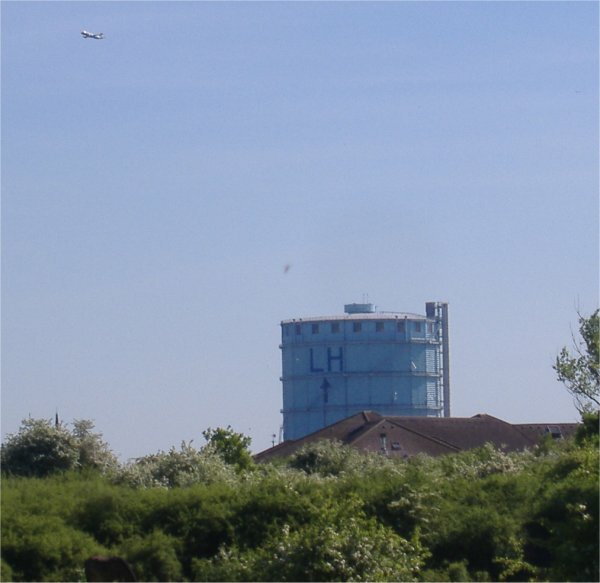 One reason for parking errr mooring here is that it is a short walk to B&Q, and this gives a very good view of my favourite West London landmark, the gasometer at Southall. What is especially good about the perspective from here is that you can clearly see the letters LH and the arrow pointing towards London Heathrow Airport. Apparently, one day a large passenger jet landed at nearby Northolt airbase, mistaking it for Heathrow. As the military have rather shorter runways, and this one ends at the A40, I gather that this was not an easy fit. The volcano that dare not speak its name! I suspect that this really should have gone into 'Little Old Man Weekly' (tm) but this is its context. I've been watching Flightradar24 again and of course to-day, with all UK airports closed, the Dutch and German airlines are running flights straight across the country, and, according to Flightradar24 straight over Heathrow airport as well, hope they waggle their wings as they go over! This is the week that sj usually visits us, and we set next Saturday for our wedding reception so she could join in the family festivities. 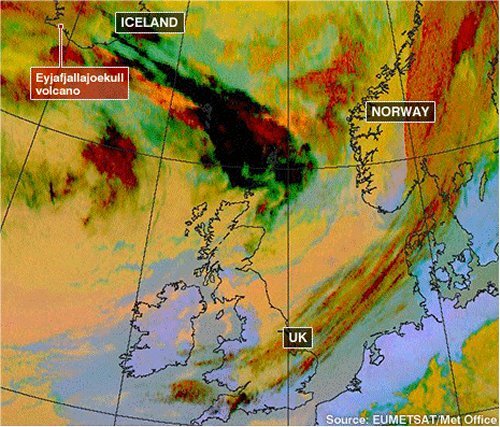 However, the unspeakable Eyjafjallajokull volcano has scotched our plans. Sj did get as far as Iceland, and we hope had a nice couple of days there, and then she got on a return flight to Boston and is en-route as I type. Of course I have been following every twist and turn of this epic journey to Eyjafjallajokull and back. 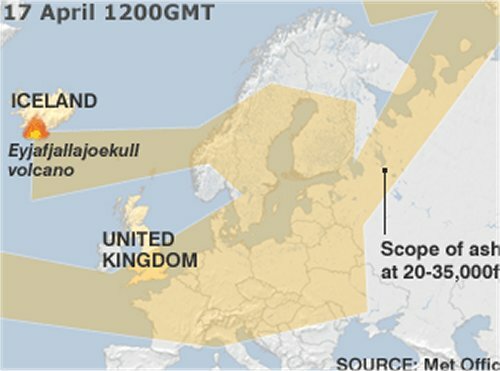 Then I discovered this website which is a 24 hour live radar scan of European air space showing location and callsign of every aircraft crossing Europe. I guess that it is usually covered in little yellow planes, but not just now. 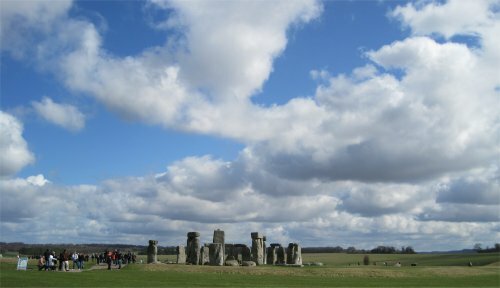 Over Easter, we went to visit Andrew in Southampton, and as we appear to be on a bit of an ancient Britain thing at the moment we went to Butser Ancient Farm on Saturday and then Stonehenge and Woodhenge on Sunday. 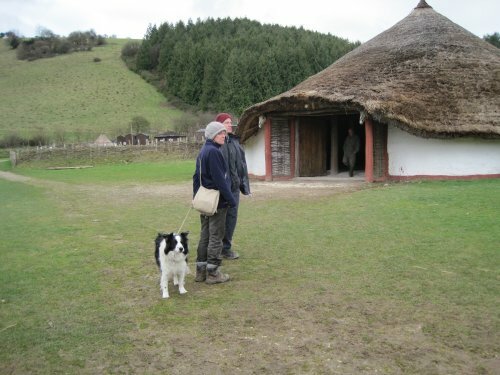 We enjoyed the iron age at Butser farm and all of us could see ourselves living in the village houses and felt that life was not likely to have been as brutal and uncomfortable as it is sometimes depicted. 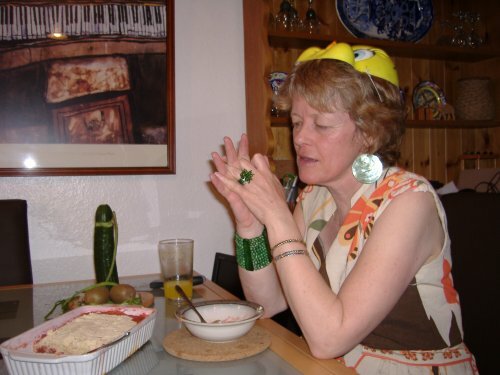 Rosemary did make a case for interceding with the arch druid for the concession of a dishwasher, but I inclined to the opinion that having only one plate, or eating from the common pot hardly justified a need. We started at the re-constructed Roman villa, as it happened to be closest, although this seemed out of time sequence at first, but when we came out, and saw the village in the background, it set a nice contrast of the 'natives' in their huts and the 'imperial' Romans in their villa. A resonance that travels through the ages. 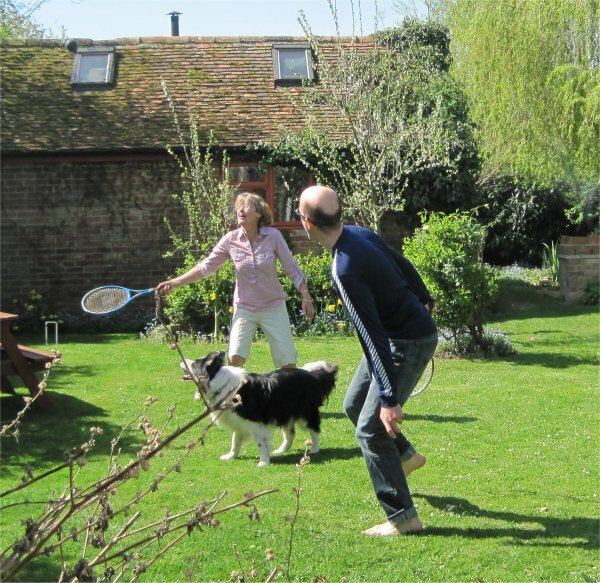 The villa is based on the western wing of an excavated villa from Sparsholt near Winchester. The interior was set up with frescos and floor mozaics and includes a working hypocaust. 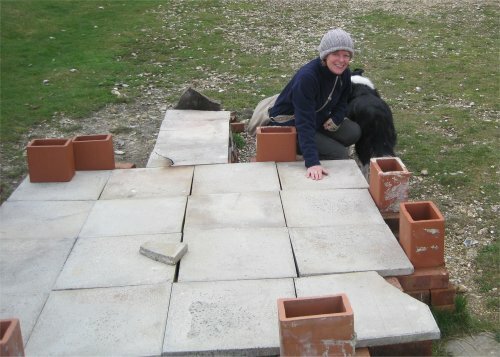 They had a small scale hypocaust set up and running just outside and it was hard to move some members of the party on to the rest of the site. 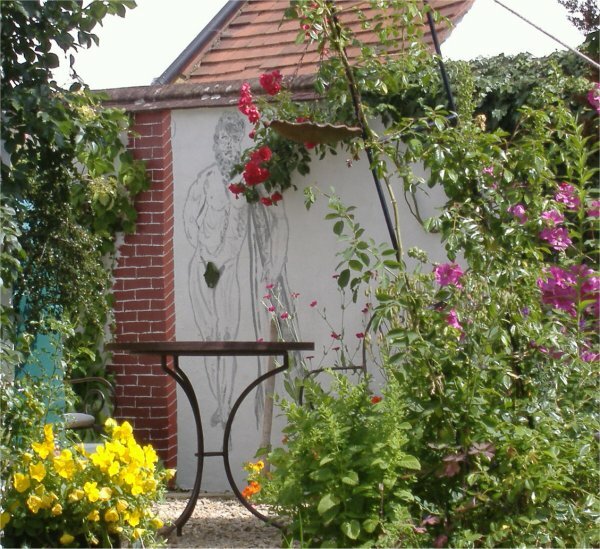 This is the 'The Little Woodbury House', constructed in 2007 and based on an excavation at Britford, near Salisbury, Wiltshire. Most of the houses had small fires burning in a central hearth and it was surprising how cosy even those large spaces felt with just a little heat. Andrew and I did remark though that we were wearing more clothes than either of us had worn when climbing, me on Crib Goch on Boxing day and he doing the Scottish Munros. 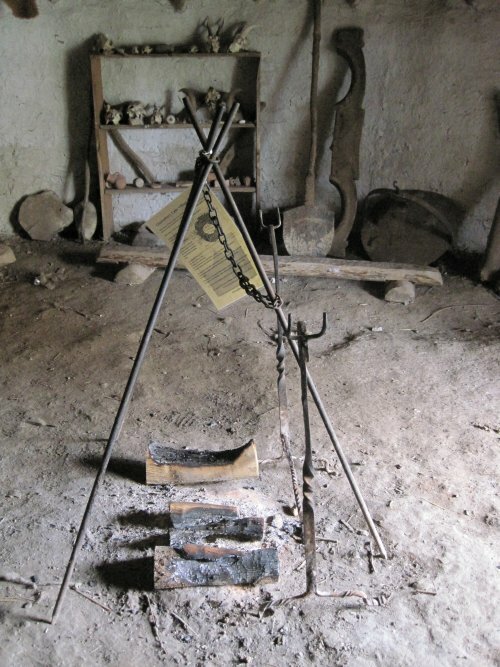 The fire and cooking utensils, inspiration for our next Catslide party? 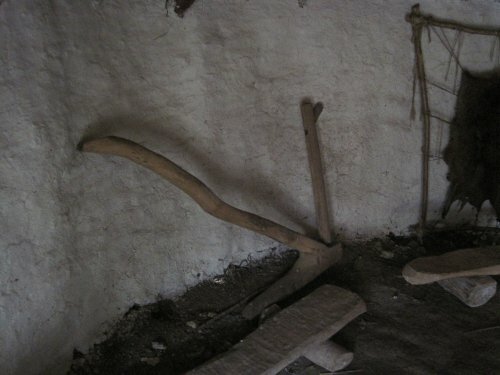 There were also bits of rustic furniture and tools, the evidence of activities involved in daily life in 2000BC, like hides tanning, warp weighted looms and this wooden plough. 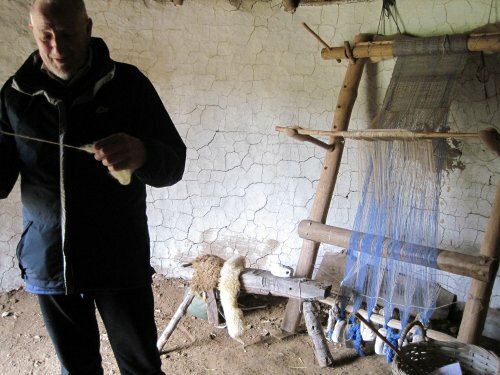 Our next stop was in the Glastonbury Lake Village Mound 59, They had set up a warp weighted loom in this hut and we spent some time investigating this. 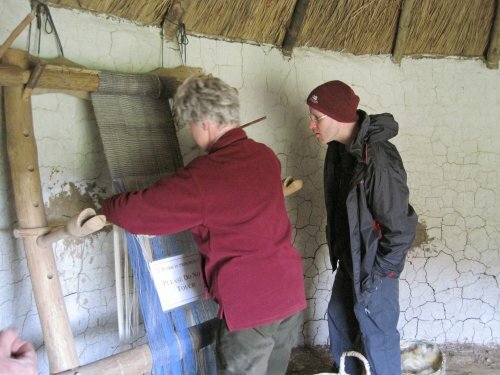 Talking to the person demonstrating its weaving technique, we discovered that she had been preparing nettle for spinning, which is what I have been doing with my crop of nettles from the allotment last year. Now one walks in a great procession at a respectful distance and can actually see the stones. On the whole I think it is better now and considering the hordes that were there to-day, this was just as well. The visitor facilities and interpretation were excrable though. The viewing path winds round the stones at a distance and the hordes of people walking round far from detracting from the monument, add a dimension to the experience, reminding us that when it was built, it must also have been just such a magnet as it is now. Woodhenge was all but deserted so gave a different perspective on our relationship to other people. Neolithic people represented the dead by stone, and the living by wood, presumably the two henges so close together evoked the relationship between life and death. 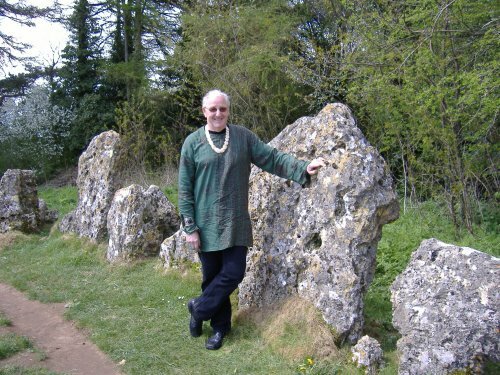 Skip down to our Beltane celebrations including the Rollright stones. Before doing anything else, I just had to put in this link to CERN. It was so exciting watching the live podcast on 30 March when they got the Large Hadron Collider up and running again. Although I should not be amused by this, I also really enjoyed seeing so many happy physicists celebrating its success. Especially so as they had come be-raymented in their striped shirts and sweaters and tank tops, with bald heads and beards a plenty. 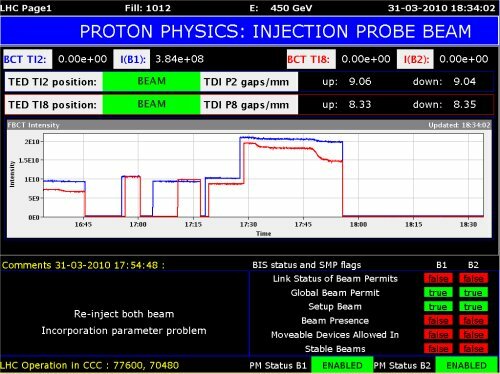 This link has had me captivated, some might say obsessed, its the LHC machine status report and I've been watching it all afternoon as they try to bring it up again. I've been forwarding every up and down of beam intensity to sj and tw. Is that just an accelerator too far?? Here is a screen dump of the beam intensities and you can see why I was excited!! To those of you with an interest in British education, all through the events of yesterday the commentator kept on refering to the LHC, as she would, BUT I kept hearing it as LSC. Now is this a case of The Little Old Man or havn't I been retired as long as I think? Large Hadron Collider about the LHC but a bit out of date! Brookhaven National Laboratory Links to all their accelerators. 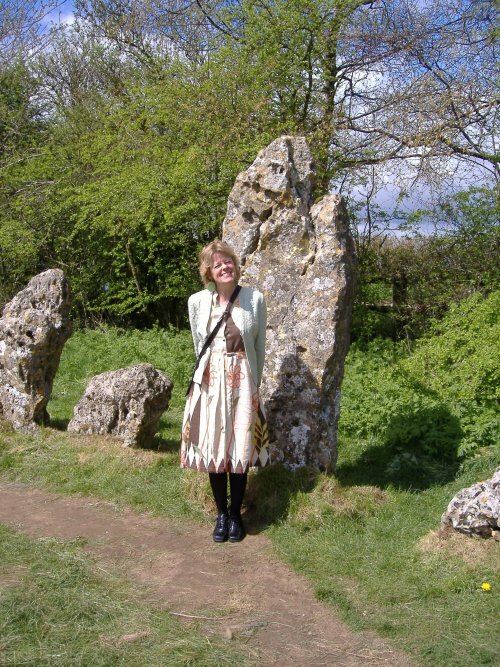 Doing the write-up about the neolithic scrapers reminded me of our visits to the Rollright Stones and especially when we took Sj there in 2007. The idea was to take her to see genuine ancient remains as counterpoint to the fake ones she had been seeking out in the US. 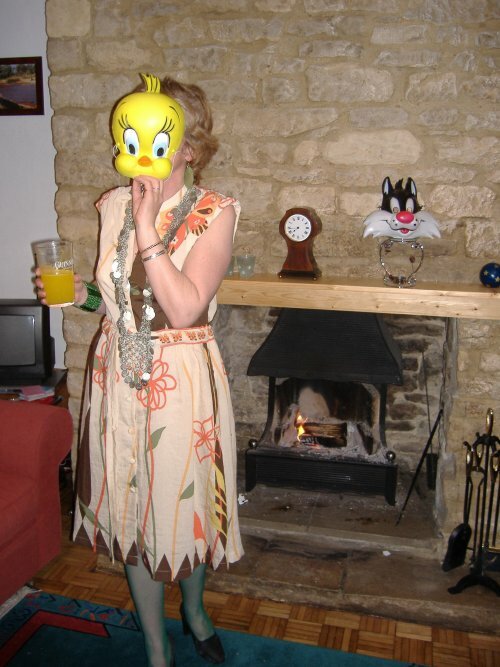 This, of course, set our tiny minds onto a pre-historic track so we had to watch 'The Wicker Man' film with her and then as May Day was close tw and I decided to celebrate the Pagan feast of Beltane. Tw and I had a happy day at Camden Market sorting ourselves out with suitable attire and acquiring dresses and 'jewells' for the girls. We would not be able to celebrate together but liked the idea that we would be holding parallel festivities in Birmingham and Witney similarly attired. 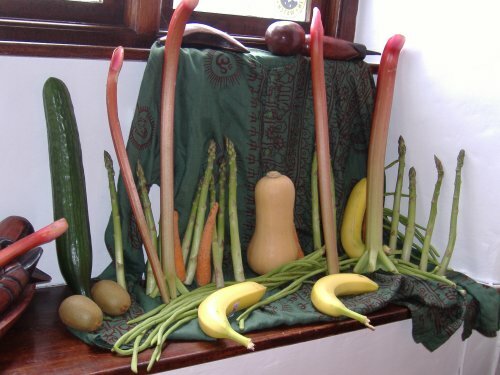 Celebrations in Witney in invoved gathering suitable items for the meal which it had been decided would be a long one with only long food served. 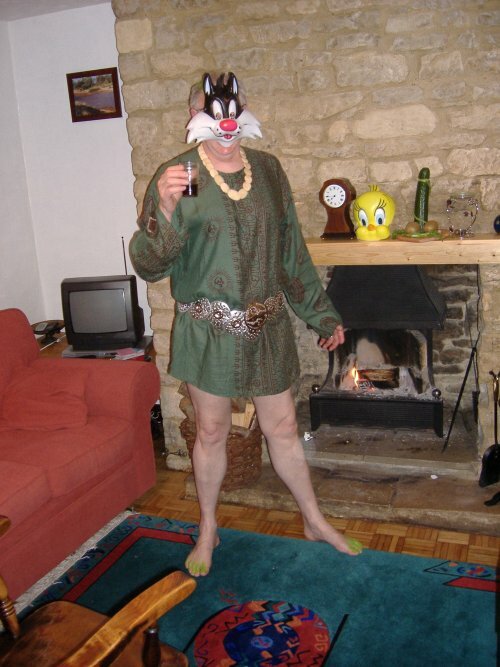 The next day, Rosemary and I headed off to the Rollright Stones in our Beltane garb. It was so cold that we did a quick walk round the stones and decided to head to the Quiet Woman Antiques centre to warm up and have a cup of tea. 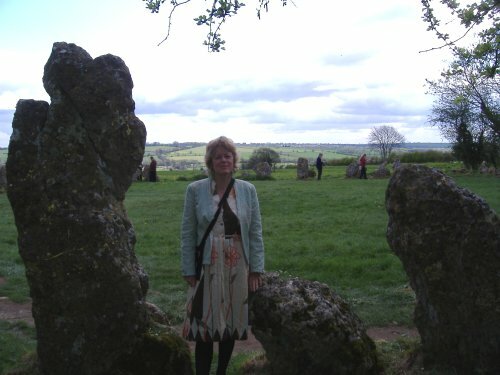 What we didn't know was that tw and le had had the same idea about the Rollright Stones and also went there. They must have arrived just after we had left which was disappointing that we missed each other though it did give rise to some speculation as to what people, more hardy than us, might have thought. First this decrepit old couple arrive and hobble arthritically round the stones, then miraculously, they are transformed into two bright young things with a spring in their step. Edward Woodward, the policeman in the film, died in 2010 and so The Wicker Man is the current Zeitgeist and so are we with our flint scrapers. In doing the write-up for this piece, I looked again at the Butser Village site and found that their Beltain event this year will have a wicker man design to pay homage to the film and in honour of Edward Woodward. Celtic festivalsBeltain, the beginning of Summer - Summer is a comin in ! Quiet Woman Antiques and warm tea shop! 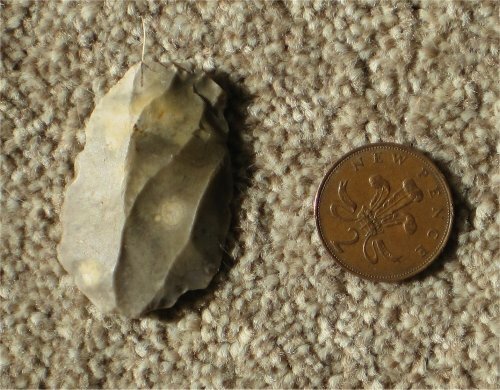 One of the things that spurred me on in my allotment digging last year was finding a neolithic scraper in one of the first spits that I dug. 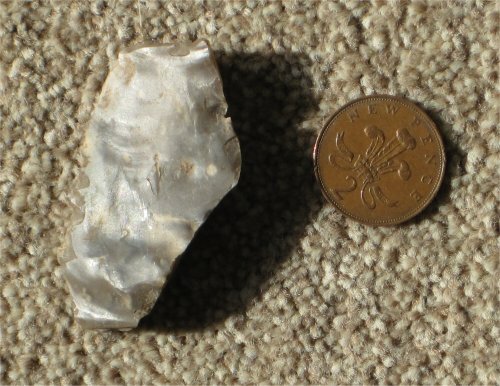 After that I was expecting a new find in every forkful and indeed, I have found quite a bit of interesting stuff, mostly pottery, though nothing as good as my first find. I showed this around in the pub when I first found it and have been meaning to write it up ever since. Really, I would have liked to know a bit more about it first so we may come back to it. 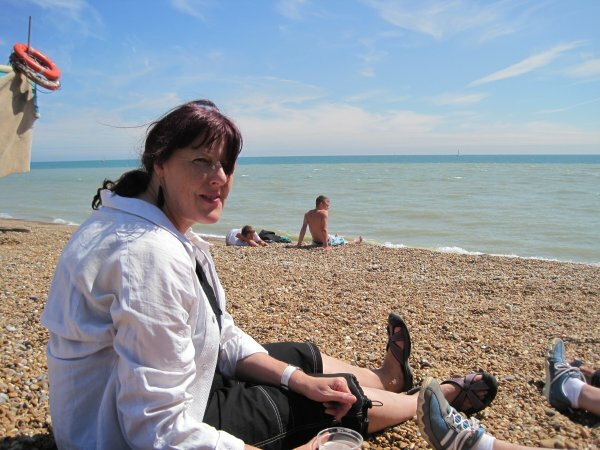 Last week, Ann found one as well so now we have a collection and you can see them below. Its marvellous to work land that has been in constant use for millenia, and still find evidence of past users. Who is to say that the large lump of melted plastic I found the other day won't be a highly treasured artifact in a thousand years or so? Belchawell this site is in Dorset. 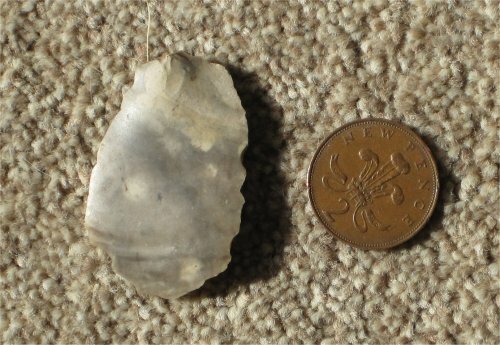 Dons website very good descriptions of flint tools. 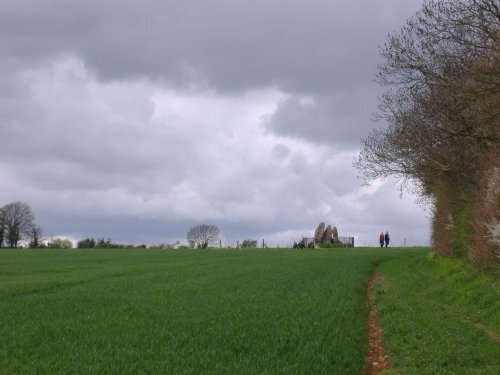 The Megalithic Portal information about and links to ancient sites around Britain and further afield. Archaeology Object Database this is run by Southampton City Council and has some really clear drawings of stone age artifacts. 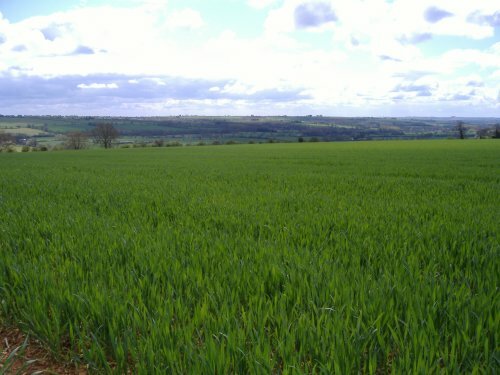 Vale of the White Horse site about the White horse and its environs. Rollright Stones site about the Rollright Stones. AND of course there are some rather less reverent offerings here on cribbit.net! 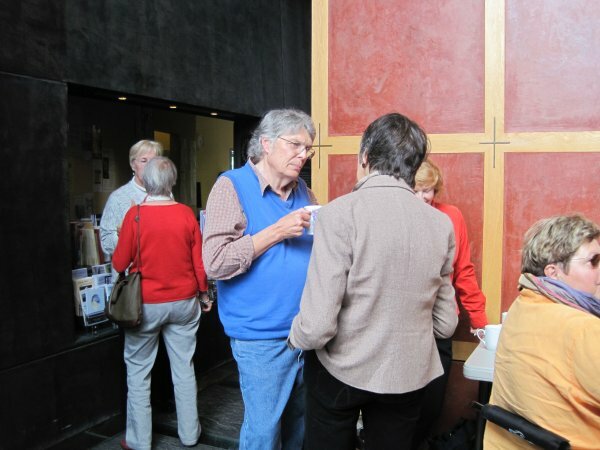 For several years, sj has taken extended peregrinations around the Southern US States. She has an eye for the unusual and bizare and her interests have been well taken care of there. She has visited, deserted towns, styroform copies of stonehenge, supposedly authentic museums showing humans and dinosaurs co-habiting, letters cut into mountainsides to name but a few. 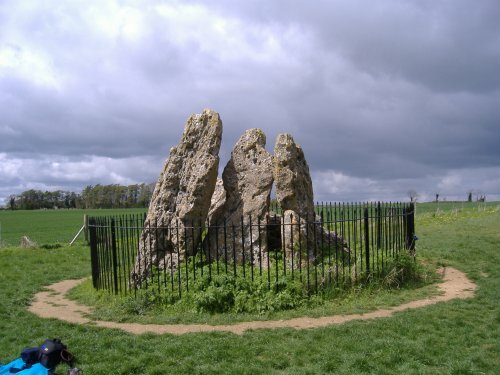 In 2007 we took her to the White Horse to see the real thing and to the Rollright stones. I have to say, that these are absolutley magical places and well worth a visit if you are in the area. 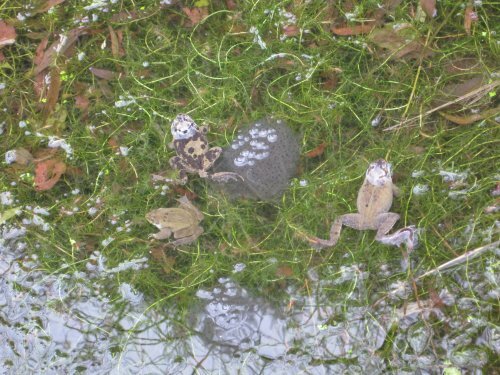 Its all hopping here at Catslide, well at least down at the pond where there is a great croaking as well. 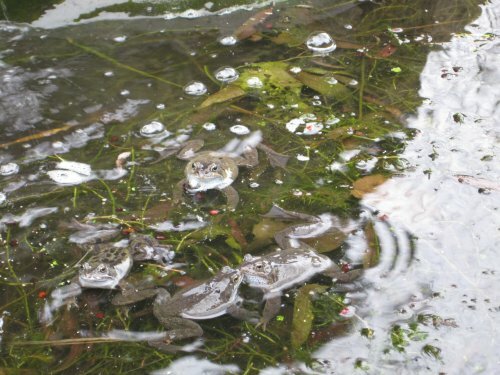 Three lots of frog spawn so far and eager looking little faces expecting more by the look of it. 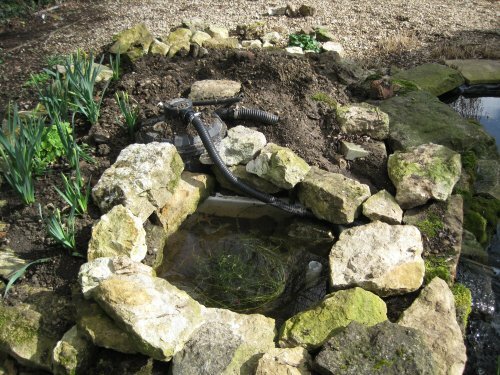 Its all very well them communing, but as result I have had to fix up the ceramic shower tray Roger gave us last year as our fish free pond. Of course it took some fiddling with redundant plumbing bits before I could get the thing fixed. I've made a leaky connection in the return pipe of the circulation circuit to keep it topped up with the overflow returning lower down. The overflow is a design based on the Griffin and George 'Constant Flow Apparatus' much beloved of VIth form physics classes. Just got to cover up the pipes now and finish off the rest of the rocks. Just back from my regular trip to Cribbit, met up with Mike at the Cheshire Cheese. Marked up the boat trip from Willowtree to Greenford and started this as a new theme. Added a piece about tw's lecture for the Institute of Physics, which includes what I hope is a simple description of his research work. This includes, making radio-active sources in the cyclotron, photos of the cylcotron, how body scanners work, how these can be taken apart and used in different ways, Positron Particle Tracking [PEPT]. Don't worry though, it is leavened by a ride in a hydrogen fueled car, our usual trips to the pub and curry house including wobbly excursions on bicycles, plus a practical demonstration of how to optimise your pizza area to cost ratio, by the sequential ordering of differently priced pizzas offered through a 'buy one get one free' promotion.